Originally published on April 12, 2017. Last updated on January 30, 2018 for up-to-date information. This is the second step in a mini three-part series on creating a successful marketing strategy for your pet business. You can find all three parts in the eBook: The Complete Guide to Pet Business Marketing in 2018. Managing your website presence is a crucial part of pet business marketing in 2018. Not only will your leads and customers be able to find you online with ease, but it will also allow them to discover resources and learn more about your company. It’s this touch of online engagement that will get them to remember your business in the long run. Unfortunately, we’ve noticed a lot of pet businesses aren’t completely up to date on the latest trends in managing a web presence. Although the upkeep of a modern website may seem daunting at first, it has actually become much easier than in the past to stay up to date and incorporate key elements of a successful site. 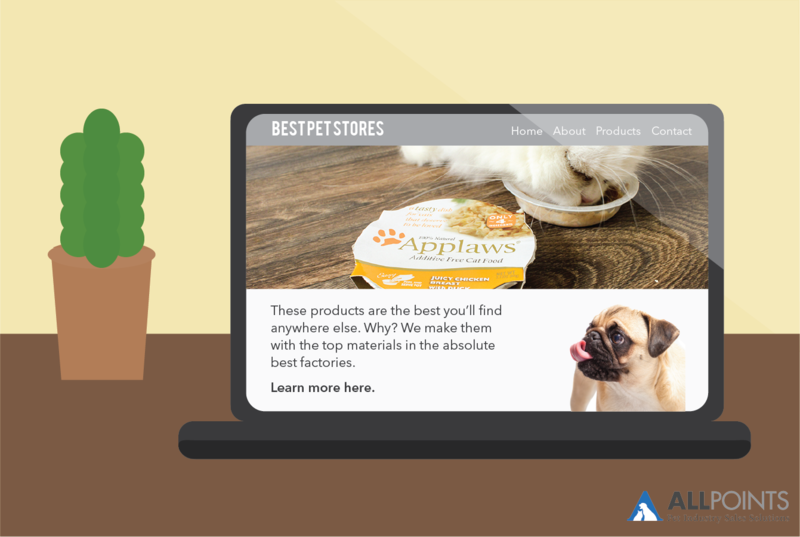 In this section of the pet business marketing guide, we’ll walk you through some of the key things you’ll need in a successful website. Then, we’ll show you how easy it is to implement them for your own company. According to a recent article, 83% of consumers in the United States will use the Internet to research before they make a purchase. If you even want customers to be able to find your store when they search “pet store near me” your website needs to be mobile-friendly. "[Consumers] expect to be able to discover, explore, buy, ask, and engage with retailers in context and moments of need, and retailers must deliver mobile experiences that match and exceed those expectations" (Forrester, 2015). Customers are increasingly using their smartphones to access the Internet and interact with retailers." The same survey by Forrester revealed that consumers were primarily using their mobile devices to research products in a moment of need (i.e. researching brands while standing in one of your store's aisles) and to find and redeem coupons while shopping. If you’re still not convinced that you need to adapt, RetailNext published a few stats that may convince you otherwise. According to a recent article, 83% of consumers in the United States will use the Internet to research before they make a purchase. Plus, if you even want customers to be able to find your store when they search “pet store near me” your website needs to be mobile-friendly. 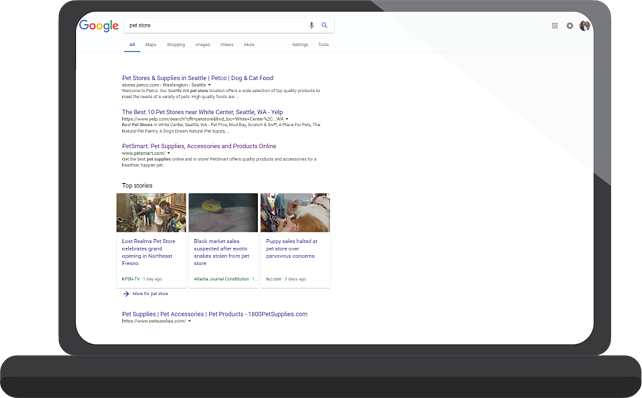 As of a recent update, Google punishes websites that don't show up well on smartphones and tablets by not allowing them to show up in search results. Now that you’ve identified the need to switch, how do you do so? This will vary based on the platform that your website is being hosted on. However, a great place to start is by searching your domain (website URL) on Google’s PageSpeed Tool. The software will give you suggestions you can use to decide how you want to take your next step, whether it’s working with your IT department (if you’re lucky/big enough to have one) or by hiring a contractor to fix your website. Another, easy to use tool by Google is the Mobile-Friendly Test. Just type in your domain again and it will tell you whether it’s optimized for mobile, and give you tips and resources on making it so. Click here to learn more about setting up mobile optimized website with guides from Google. Search engine optimization is what allows your website to be ranked on Google. It also lets customers, and potential customers, find you when they search relevant keywords. In a recent article, we discuss competing against e-commerce as a pet store. If you're truly interested in competing, it's time to properly optimize your website. Come up with some primary topics that your website will cover and write them down. If you own a pet shop, you'll want to write down words such as "pet store" or "pet supplies." Hint: Think of topics that are differentiating for your store...do you only sell cat and dog supplies? Are you specialized in organic foods? Include words such as these in your list (i.e. "Pet store selling organic food"). Then, write down more that include your location. If you're a pet supply store in Seattle, write down "pet store in Seattle" or "pet store in Western Washington." Congratulations, you have now come up with your initial keywords. Now, you'll want to use those to conduct some keyword research. Basically, you'll want to find out whether your words are things that your consumers are actually searching for online. Use tools such as Google Trends, Google Keywords Planner, Moz, and SEOBook to figure out which keywords will give you the highest ranking possibilities. To find out more and get a little more in-depth about doing keyword research, visit this beginner's guide by HubSpot. Start with an audit of your website. If you already have a website, and content on it, that you're already using, you'll want to go through and make sure your content is already optimized to be ranked on search engines. Follow the steps under step one here to complete your audit. Remember those keywords we just came up with? Now you'll want to put them to use by placing them into 5 critical places on your website. Following the 5 crucial places below, let's say you have a page discussing how you go about choosing cat food for your pet store, and that "natural cat food in Seattle" is your keyword. You'll want to make sure your keyword is somehow mentioned in all of the 5 places below. Avoid search penalties. There are ways to actually ruin your SEO ranking by doing things differently than Google, or another search engine such as Bing, would like for you to do. Don't hide your keywords, stuff them into every other sentence, or force your keywords where they don't belong. Believe it or not, Google's algorithms are smarter than that. 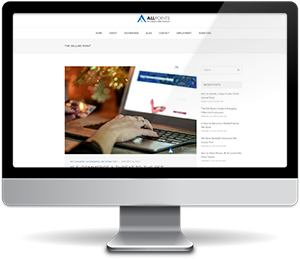 Find out more about optimizing your website here. Publishing content on a consistent basis keeps your website, and overall web presence, up to date and ranking high on Google. When combined with a strong SEO strategy, posting content on a regular basis can do wonders for your search rankings. What does this mean in English? You’ll get more traffic, and more qualified traffic (people looking for your product/services), than ever before. Of course, publishing new content takes a lot of time and resources. If everyone could easily do it, then more people would be. However, there’s a few ways you can get new content on your site all the time. Use a freelancer to create content for you whenever you need it. There are lots of websites (i.e. UpWork or here) where you can find high quality freelancers in your budget. Note that this will take some of your marketing budget, but the results will be well-worth it. Posting consistently doesn’t necessarily mean posting all the time. You don’t need to keep a daily blog on your site in order to rank well. We recommend publishing weekly, or at least monthly, in order to keep your website updated. The less you publish, the more pressure there is to create high-quality content. The key here is to pick a time frame and stick to it. Consistency is key when it comes to keeping up your online presence. Work with a marketing agency to help you get started. Marketing agencies have been around the block and know the best tricks and tips to keeping up a web presence on a small time budget. They can be costly, but it can be well-worth investment to make sure your customers can find you online. Now that you have a structure for creating and publishing content, the next step is coming up with ideas that will educate and entertain your leads and customers. Some may find this easier than others. Either way, there are plenty of resources to help with inspiration. BuzzSumo - This paid service will allow you to find top and trending content for any topic in the pet industry (or any industry). It’s a valuable tool that will inspire you and let you know what’s trending in your space. Pet industry trade magazines - Magazines and websites popular for finding out what’s new in the pet industry include Pet Age, Pet Business, Pets +, Pet Product News, and Pet Food Industry. You can search these articles for inspiration, and identify which keywords they are going after by looking at top trending topics for discussion. Pet industry newsfeeds - Subscribing to newsfeeds and newsletters will keep you automatically up to date on popular industry topics. The World Pet Association has a great newsfeed, and we send out a monthly newsletter with current market trends for the industry. Content ideas can come from everywhere - not just pet industry news. As long as you’re out in the world, engaging with your customers, and taking in content all the time, you’ll become accustomed to picking up great topics to discuss on your website. Be sure to write any ideas down as they come to you - otherwise you’re sure to forget them by the time you sit down to write (or send an email to your contracted writer with content ideas). As you can see, there’s a lot more to a successful online presence than an old website with just an “About us” page. Staying on top of your website will ensure your success in marketing your pet business. Although it may seem like a lot of work, it’s easy once you get started. Plus, much of the work can be completed by third-party freelancers and contractors. Just remember to keep up on your content strategy, and refer back to your marketing plan (created in part one of this pet business marketing guide) if you get lost. This is the second step in a mini three-part series on creating a successful marketing strategy for your pet business. You can find all three parts in the eBook: The Complete Guide to Pet Business Marketing in 2018. Additionally, you can subscribe to email updates at the bottom of this post to be notified when the next post in the series is published.